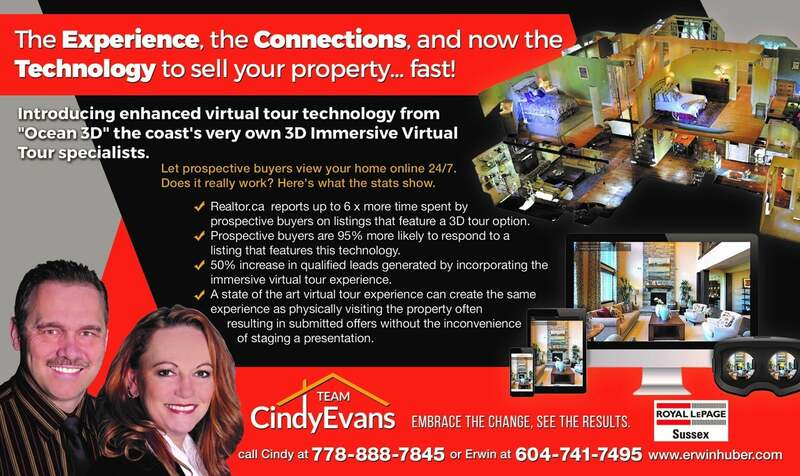 I am introducing state-of-the-art technology to promote listings here on the Sunshine Coast and offering the most effective and successful marketing program available anywhere in the industry today. If you're thinking of selling your home, I offer my clients a very unique, full-service, marketing program, developed with almost 2 decades award-winning experience and extensive real estate marketing knowledge. Beautiful design evokes emotion. Emotion stirs the soul and creates a connection between a potential buyer and a home. I understand the smallest 'touch-points' in a buyer's decision journey and I believe home marketing should be memorable and beautiful. 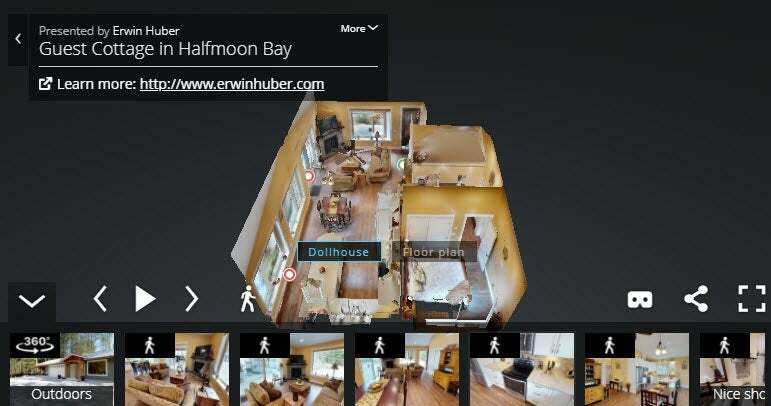 3D immersive virtual tours of your home that are unique, consistently compelling and buyer engaging. I work with a creative group of specialists committed to delivering the highest caliber of professional real estate service here on the Sunshine Coast. Best of all - no additional cost - compare services – date to compare! Canada 2017 2.7 1.8 1,308 sq. ft.
2018 2.7 1.8 1,269 sq. ft.
Halifax 2017 3.1 2.4 1,787 sq. ft.
2018 3.1 3.0 1,736 sq. ft.
Ottawa 2017 3.0 2.2 1,487 sq. ft.
2018 2.9 2.3 1,495 sq. ft.
Calgary 2017 2.6 2.0 1,195 sq. ft.
2018 2.6 2.1 1,210 sq. ft.
Regina 2017 2.9 2.0 1,356 sq. ft.
2018 3.0 1.7 1,341 sq. ft.
Winnipeg 2017 3.0 2.0 1,482 sq. ft.
2018 3.0 2.0 1,413 sq. ft. Greater Montreal Area 2017 3.1 1.7 1,468 sq. ft.
2018 2.9 1.5 1,344 sq. ft. Greater Toronto Area 2017 1.6 1.4 816 sq. ft.
2018 1.7 1.4 856 sq. ft. Greater Vancouver 2017 1.7 1.4 878 sq. ft.
2018 1.5 1.2 788 sq. ft. In Greater Vancouver, Canada’s most expensive market, high home values have pushed many peak millennials into the suburbs, like Coquitlam, Langley and Surrey, or further east into Abbotsford, Mission and Chilliwack where properties are even more affordable. Over the last year, high rates of price appreciation and heightened competition over listings within the region’s entry level market have made it difficult for peak millennials to find property, especially in the downtown core. At the time this release was written, only five active listings in Vancouver proper were available for purchase between $325,000 and $425,000. In the first quarter of 2018, purchasers within the region got significantly less home relative to all other regions studied, with a $325,000 to $425,000 budget buying an average of 1.5 bedrooms, 1.2 bathrooms and 788 sq. ft. of living space. “As prices continue to grow across Greater Vancouver, peak millennials have found it hard to find a home,” said Adil Dinani, real estate advisor, Royal LePage West Real Estate Services. “New mortgage regulations have weakened this demographic’s purchasing power, making it tougher to compete with other buyers who now find themselves in the entry-level market as well. Living Area: 1,095 sq. ft.
Across the mountains in Calgary, peak millennial purchasers fared significantly better than their Greater Vancouver counterparts when looking for a home between $325,000 and $425,000. On average in Calgary, this budget bought a 2.6 bedroom, 2.1 bathroom single-family home during first quarter of 2018 with 1,210 sq. ft. of living space. Recently, the region’s improving economy and relatively less expensive home prices have enticed many peak millennial purchasers from British Columbia into its residential real estate market in search of affordable property. Together with native Calgarians, these prospective homeowners tended to search for property in the region’s suburban markets in order to find larger, fully upgraded two-storey homes. “While many Canadians left Alberta during the province’s economic downturn in search of jobs, the region’s recent economic uptick has enticed a growing number of B.C. residents to move to Calgary to take advantage of affordable home prices,” said Dawn Maser, realtor, Royal LePage Benchmark. Living Area: 1,546 sq. ft. Despite the region’s great affordability relative to other markets studied across Canada, peak millennial purchasers are increasingly looking for family assistance to purchase a home in Regina, in part due to its muted, but recovering economy. Although many have saved enough money to cover a down payment on an entry level home, to qualify for a mortgage under newly introduced regulations, peak millennial purchasers have had to increasingly get family members to cosign their mortgages in order to get approved. During the first quarter of 2018, a peak millennial’s budget of $325,000 to $425,000, bought them a single-family home with 3.0 bedrooms, 1.7 bathrooms and 1,341 sq. ft. of living space in the region. Peak millennials in the Winnipeg real estate market continue to face strong competition for available property in the region, with many homes in the entry-level market garnering multiple offers and selling above their asking price. While couples can largely afford more than the average home found within the region, many have elected to look to lower-priced segments to ensure a high quality of life instead of large monthly payments. Another growing trend in the region is the increase in the number of young, professional women who are becoming sole property owners. “Even when facing stiff competition, peak millennials fare extremely well in Winnipeg’s residential real estate market,” concluded Taylor. During the first quarter of 2018, Winnipeg’s residential real estate market continued to offer peak millennials considerable value relative to other regions studied. With a budget between $325,000 and $425,000, these purchasers were able to find a home with an average of 1,413 sq. ft. of living space, 3.0 bedrooms and 2.0 bathrooms. Living Area: 778 sq. ft. Peak millennials are finding it harder to purchase property in the Greater Toronto Area, as competition and price appreciation in the entry-level segment continues to intensify despite other housing segments witnessing some price softness. Recently, younger prospective homeowners have begun to either look to pre-construction units, or areas outside of the metropolitan area in order to break into the market. While having to either wait, or simply change some of their initial expectations, these actions can be seen as a direct result of many feeling that, if they don’t buy now, entry-level home values may continue to rise completely out of their reach. “Despite the Greater Toronto Area residential real estate market largely slowing since the beginning of the year, entry-level properties continue to trade hands, as new mortgage regulations have pushed many into the segment, increasing competition amongst buyers,” said Tom Storey, sales representative, Royal LePage Signature Realty. “Overall, the new stress test has severely impacted peak millennial purchasers. With added competition, and a shortage of inventory driving prices up, it is getting harder and harder for peak millennials to pass the stress test and find affordable property. “Now, we’re seeing many younger purchasers look to regions like Halton, Waterloo or London for affordable property, or simply buy pre-construction condominium units in hopes that they will be able to qualify for a mortgage once it is needed down the road,” concluded Storey. During the first quarter of 2018, peak millennial purchasers with a budget of $325,000 to $425,000 bought a home with an average of 1.7 bedrooms, 1.4 bathrooms and 856 sq. ft. of living space. Of particular interest, the average GTA-based home’s square footage in this segment increased year-over-year, growing from 816 sq. ft. in the first quarter of 2017. This is a result of many condominiums in the downtown core surpassing $425,000, making larger properties in the north end of the Greater Toronto Area the preeminent housing stockfound in this price range. Contrary to peak millennials in the Greater Toronto Area, those in Ottawa fare extremely well when searching for property in the region. Boasting a median aggregate home price of $437,243 during the first quarter of 2018, properties within the region remain relatively affordable, offering peak millennials a chance to enter the market at an early age. With strong economic growth and ample job prospects, younger purchasers are largely able to afford the majority of homes in the region, yet seek out properties at lower price points to ensure that they can still enjoy a relatively high quality of life despite the new monthly expenses associated with homeownership. On average, during the first quarter of 2018, peak millennial purchasers within the region could afford to buy an attached, single-family home with 2.9 bedrooms, 2.3 bathrooms and 1,495 sq. ft of living space. “Recently, we’ve seen greater demand from peak millennials in the Ottawa residential real estate market thanks to the region’s booming tech sector,” said Adam Mills, broker of record, Royal LePage Team Realty Adam Mills, Brokerage. “Purchasers within this age range are generally looking for move-in ready homes that require little to no renovations and are within a reasonable distance from work and local amenities. “Despite the availability of larger, detached homes in the rural areas just outside of Ottawa, many younger prospective homebuyers simply remain uninterested in sacrificing commute time and proximity to amenities for more space at the end of the day,” concluded Mills. Living Area: 1,083 sq. ft. Recently, peak millennials have begun to find it hard to find property in the Greater Montreal Area, as heightened competition, multiple offers and low inventory levels have pushed prices beyond their means. As a result, an emerging trend is that these prospective homebuyers are seeking financial assistance from family members more often to avoid resetting expectations on their first home. In the first quarter of 2018, the typical home in the region available to peak millennials with a budget between $325,000 and $425,000 was a condo with an average of 2.9 bedrooms, 1.5 bathrooms and 1,344 sq. ft. of living space. While fairly comparable to the average home found in Regina in this segment, inventory within this price range was scarcer across the Greater Montreal Area during the first quarter of 2018, creating more competition over the few listings available. Peak millennials are increasingly turning to Halifax’s residential real estate market for its affordability relative to the rest of Canada. Many international students and prospective homeowners from Ontario have decided to enter the region in order to find large, move-in ready homes. These groups, along with local residents, are often choosing to purchase townhomes or condominiums that are near the downtown core, given that they are in close proximity to local amenities and offer little maintenance in comparison to large detached properties found in outlying rural regions. Overall, when looking at homes available between $325,000 to $425,000, Halifax offered peak millennials the most value when compared to all other regions studied. During the first quarter of 2018, peak millennials with this budget could purchase a home in Halifax that had 1,736sq. ft of living space, 3.1 bedrooms and 3.0 bathrooms: the highest number of bedrooms and bathrooms in this segment. The government expects to introduce legislation in the fall to make the tax part of law and they say 99 per cent of British Columbians will be exempt from paying the tax. The tax will be applied on properties that are not the primary residences of the owner — they’re not living there for more than six months per year — and that aren’t being occupied by a tenant when the owner isn’t there. Previously, a number of areas where British Columbians owned vacation homes, cabins or similar were to be hit by the tax, essentially meaning that people would be forced to pick one property as their primary residence and paying the speculation tax on the other. A map of where the BC government’s speculation tax applies. 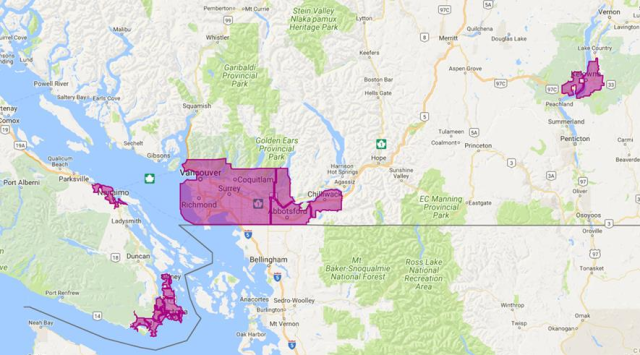 Now, second properties will only be hit with the speculation tax if they’re in Metro Vancouver, the Capital Regional District (but excluding the Gulf Islands and the Strait of Juan de Fuca), Kelowna, West Kelowna, Nanaimo-Lantzville, Abbotsford, Chilliwack and Mission. All properties that are affected by the tax will pay a rate of 0.5 per cent in 2018. In 2019, the rates will change. From 2019, B.C. residents who are subject to the tax will pay a rate of 0.5 per cent; Canadians from outside B.C. who have properties in the province that are subject to the tax will pay a 1 per cent tax rate, while non-Canadians will continue to be hit with the previously-announced 2 per cent rate. Second properties belonging to British Columbians will be eligible for a $400,000 non-refundable tax credit, meaning second properties whose assessed value is less that $400,000 will be exempted from paying the speculation tax. Property owners “facing special circumstances” will be exempt from the tax. This covers properties where the owner or tenant is “undergoing medical care or residing in a hospital, long-term care or a supportive-care facility,” is “temporarily” absent because of their job or the owner is deceased and the estate is under the process of being administered. If a secondary property is rented out as a long-term rental, it will be exempt from the tax. From 2019, a long-term rental property will be one where the owner is not living in the property but is able to rent it out for more than six months per year. The property can be rented multiple times in a year, but each tenancy must last at least 30 days. Watch monthly video that looks at the latest news affecting real estate activity in Metro Vancouver. REBGV President Jill Oudil provides a summary of February 2018 housing market statistics.